Several weeks ago I was talking to a college Lit & Comp professor. He lamented the writing skills of most of his first year students. But not all writing. Most students are capable of solid expository writing. It’s their skill with persuasive writing that’s the problem. I said, “Let me guess, they’re weak at writing a thesis statement that can be argued.” He looked at me surprised, and wondered how I knew that. Well, I teach grade 10-12 language arts. I spend three years teaching my students how to write a persuasive essay. For most, it takes that long. Part of the problem is that our current school system isn’t great at producing independent thinkers. Without this ability, it’s hard to create a great thesis statement, anticipate the arguments against it, and then compose your argument in light of this. So for three years, I write for them, and with them. We talk about opening paragraphs, and they learn how to write it with their thesis statement either as the first or last sentence. The latter requiring more skill. They learn to use transition words, embed quotations to support their argument, active vs. passive voice, varying sentences, and many other skills, all in the hopes of creating a strong argument. And while I love teaching formal persuasive essays, the bottom-line is that even though they learn all of this, they’re still only semi-literate, at least according to the definition of 21st Century Literacies. While traditional essay writing may not help alleviate this situation, I think blogging can. Here’s the problem; Blogging is an entirely different beast. And one of the things I’ve learned about my students, is that they don’t necessarily transfer a skill they’ve learned in one area to another, without difficulty, or even prompting, for that matter. For one, the paragraphing is different. The large, solid paragraphs of prose that can be found in a typical persuasive essay, can feel arduous and cumbersome, to all, but the most determined reader. Instead, blog paragraphs tend to be shorter. It allows the piece to feel fluid and speeds up the rate at which your reader reads. And while I still use transition words, as many aren’t necessary to provide the piece with a feeling fluidity and coherence. Sometimes, a paragraph is one, simple sentence, used for emphasis. Another thing is the thesis statement. It’s placement, in a blog, is up for grabs. Did you catch where mine is? Actually, I haven’t written it yet. Huh?! Blogging also requires a different voice. The way I blog isn’t quite how I talk, but it’s no where close to how I write a formal essay. Furthermore, the voice used in blogging needs to be rich, sharp and distinct, to gain an audience. In a formal essay, I would never use a sentence fragment. Ever. In a blog, it provides emphasis. Nor would I use slang in an essay. But here? Yep. In one of my posts, I double-dog dared my readers. Could you imagine double-dog daring anyone in an essay? If you try it, let me know the result. Another thing that changes is providing your reader with evidence to support your points. In the typical formal essay, I teach my students how to quote directly, indirectly, and using individual words. Blogs still use direct quotes, but an indirect quote can be as simple as a vague mention and a link. But why does this matter? Because I think blogging is the new persuasive essay –my thesis, finally. Truth is, I love writing essays. There’s something satisfying about bringing the chaos of thoughts to an elegant form. But I love blogging more. It feels like playing. I also find it more useful. While our students will need to know how to write essays to get through university, many won’t use if after that, unless they remain in academia. I’m not arguing for the abolition of the essay; I think it has its purpose and place. However, most of the essays written by our students, likely end up in the garbage and deleted from their documents when they’re no longer needed. And most are for an audience of one. Blogging has the potential to reach and influence many. Furthermore, it has greater potential for being a life-long skill. And isn’t that our goal in education? People from all walks and professions blog for the purpose of teaching, creating, and informing. And in the masters courses I’ve taken, so far, I haven’t written a paper, but both have required blogs. Why? Because blogging is the new persuasive essay. If we’re trying to prepare our students to think critically and argue well, they need to be able to blog. It allows for interaction. It allows for ideas to be tested. And the best posts tend to have a point that can be argued. I think blogging across the curriculum, not just in Language Arts, allows for both formative and summative assessment. Blogs allow us to see the progression in the development of both thinking and writing. It may actually take more talent to create an interesting persuasive post on the French Revolution than a traditional essay. But they need to understand how and why the mechanics of the blog are different. The solution? Blogging needs to start earlier, much earlier. I read recently of a kindergarten teacher who blogs with her students. Great idea. There’s a teacher in my division who does amazing things with her grade one class. I’m not proposing that you need to do things radically different. Teach whatever you would teach for Language Arts, or other subjects, but include a blog component. So if you’re teaching sentence structure, teach your students to create complete sentences while blogging. Blogs, like traditional writing, need great structure. If you’re focusing on capitalization, punctuation, transfer this skill to blog writing as well. If you’re teaching paragraph structure, teach students the paragraph structure required for traditional essays and that for blogs. They’re different. Explain why. It’s likely they won’t be good at it at first. But there is merit to the quote, “Anything worth doing, is worth doing badly. The middle years teacher at my school used to stress out when we talked about student writing. She wanted to know if she was teaching them enough. My reply, “All I need them to do is write solid paragraphs. If they can do that, I can teach them all kinds of things.” Really, everything I teach is either an addition to, or subtraction from, a solid paragraph. My work builds on her work. I don’t need her to teach what I teach. That’s my job. But without her previous work, mine becomes much more difficult. The same is true with blogging. Starting from scratch with blogging in grade 10 isn’t impossible. But we could do so much more if they already had the basics. In order to write well, you need to write a lot. If you don’t currently teach your students to blog, please start. Our students need you to. And if you already teach your students to blog, keep it up. Because blogging is the new persuasive essay. photo courtesy of tony hall — cc flickr. Wow, George, that’s amazing! I knew your school had a technology component, but I didn’t realize it was so extensive. I’ve decided to begin teaching my 6 year-old how to blog because I know she won’t learn it at school. How did you go about implementing such an extensive program? Brilliant. I’m posting this on my Education blog! Jim Burke has described blogs as a new genre. You’re onto something here. While blogs may not ultimately be as intellectually satisfying as a longer essay, they are definitely an excellent teaching tool for helping students learn to focus, cohere, persuade, and write with a reader-friendly tone. I had no idea that Jim Burke described blogs as a new genre, but I can see why. It seems to have different qualities than other writing. I took a look at your ning; It’s beautiful! How did you decide on creating a Ning, as opposed to another format? It looks like something I might want to try. I also took time to read some of your student’s blogs, very well done. I especially liked the ones on ACTS. I’ve had time to read your blog posts today. You are very insightful about what you do. Congrats on the Invisible Children as well providing an exciting learning environment for your students. I agree with your idea about allowing students to blog. Getting students to write, in any form, is positive to their learning to become adults not just good students. Thank you for making me think today as I get my brain back from relaxation to teaching mode. Thanks, Tana. I hope you have a great first day back! Thank you for this thoughtful and well-written post. I agree completely when you say that blogging – like most composing – can help students think critically and well. You make a persuasive case for blogging in the classroom. From my perspective, though, blogging as a format for writing and publishing allows for so much more than what might be defined as the hallmarks of the persuasive essay. I think of blogs that combine visual or multimedia elements, for instance, or even posts whose main goal is not just to persuade but to inform or enrich or simply beautify. I would not want us to conflate the possibilities of form with the elements of genre, in other words. You’ve given me lots to think about with this, your persuasive essay about blogging as persuasive essay. I absolutely agree that a blog can be so much more than persuasive writing. And it should be! I don’t always blog to persuade. Usually I blog to figure out what I’m thinking. For me, I’m seeing the power and potential that blogging has for my students, as persuasive writers. Unlike paper, it allows them the opportunity of having a persuasive piece that can include rich, multimedia elements, and allows their voice to heard, far beyond me, as their teacher. Thank you for your article I am currently introducing persuasive writing in my 5th grade classroom, and we have been blogging already this year. Your article continues to support my belief of the integration of writing with technology. I also have a class set of iPods so we are going to try some apps like Storyrobe and we already used Storykit with success. My blog is http://www.teachingin21.blogspot.com/ if interested in following the first year journey of our class set of iPods. I think you are absolutely right, when we take away the independent thinking and creativity, it is hard to expect students to write pursuasively. Blogging gives students that platform to gain back some of the identity they lose in the world of standardized tests, rules, and grades. This is really great insight, Shelley. Your students are lucky to have you. A former colleague who had taught writing for decades once told me “good writing is good thinking.” Her point was that you can’t expect good writing until there was good thinking happening. It has been my experience with student blogging, that releasing them from the confines of the expository essay actually improves their thinking – being outside the box allows them to focus more on their ideas and to be creative. In finding their voice, their thinking and writing improves over time. Thanks for sharing your thinking. Let’s hope more teachers incorporate blogging into their classes. Wow Shelley – finally getting through my backlog of ‘favourites’ and BOOM! Blogging is the new persuasive essay for all of the reasons you state. I would also argue that blogging does what the persuasive essay cannot: allow students to become intimate with a subject in a way that a formal essay will never be able to replicate (at least for those not scholarly inclined). Typically students were engaged in class, orally proficient, participating in activities and discussions. However, when it came time for written output (i.e. 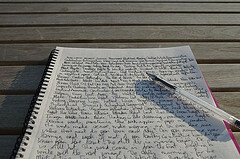 essay) and the rigour of doing work outside of the classroom (i.e. homework) . . . nothing. In the end what blogging has done has given our students a vehicle to engage, to be a “part of the ‘literary’ club”: its has helped them move classroom action into personal reflection and by sharing within a network, allowed them to feel the ‘rush’ that comes from people expressing that they value your ideas. Isn’t this what education is about: helping kids move from the extrinsic merit of grades to the intrinsic merit of knowledge for the sake of creating deeper knowledge and . . . community. Don’t know if that persuasive essay can convince me of this. Great ideas in there, Shelley. I’ve written previously about my thoughts that blogging had its roots in the writers of the enlightenment, especially Montaigne. Well, that was my thesis – I’m not sure how persuasive I was. 🙂 You can be the judge, if you wish. I’ve always thought of my blog, in its various incarnations, as my outboard brain. (and the lack of activity in it of late might say something about my state of mind). Getting students to blog – persuasive or not, as long as it is honest and meaningful – will surely promote the habits of reflection and articulate communication. I can’t think of any better skills for life that we could offer. I absolutely agree that not all blogs need to be persuasive. In fact, I blog for the same reason you do, to think, not really to persuade anyone of anything. But I think it’s a powerful medium for our students to connect and communicate with the world. And you’re definitely right that some of the best skills we can try to cultivate in our students are reflection and communication. Thank you for sharing! You sum up so much of what I have been trying to articulate in my thesis. Blogging is not against traditional forms of writing; it enhances the process. Hope you don’t mind that I’m following you! I’m considering being a teacher, and this blog looks like a great resource.